Acoustic desert blues ailing from the bend in the Niger River that was home to Ali Farka Toure, delivered by a man from Goa (North of Mali) who has been a quiet force for some years…..
Sidi Touré made his first guitar as a child, constructing it from his wooden writing slate in the ancient town of Gao, Mali. Once the heart of the Songhaï empire and burial place of its Askia kings, the town rests between the Niger and the encroaching ocean of sand known as the Sahara Desert. The Songhai empire was the last of the great empires of the Sahel, reaching its zenith under Soni Alibert (Sunni Ali) in the mid 400’s. Sidi Touré was born here in 1959, but to be born a Touré, a noble family who trace their lineage directly from the Askia kings, carried a significance and onus of a past that reaches directly into the present. Like another Malian noble turned singer, Salif Keita, Sidi Touré faced a conflict between the inexorable pull of music and the expectations of family and society. Touré’s family had been sung about, and sung to, by traditional griots for centuries, but until a small boy challenged the rules, the Touré’s did not sing! 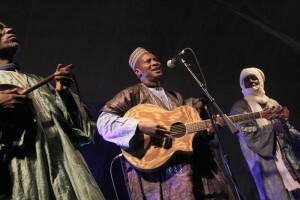 Despite his family’s disapproval (Sidi’s older brother would often break his homemade guitars in protest), Touré became the lead singer of his school’s band. In 1976, Touré became the youngest member of Gao’s regional orchestra, the Songhaï Stars, who played bi-annual festivals like the Bamako Biennale and toured both regionally and nationally. 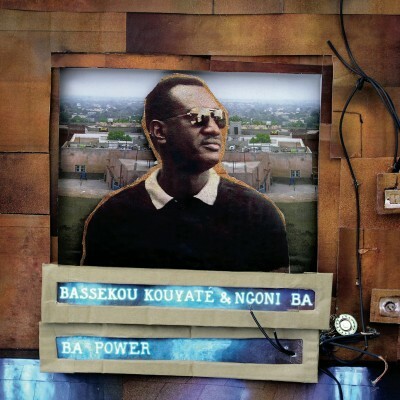 Early on, etiquette and convention demanded that he sang in Bambara, the regional language, which often found Touré singing lyrics in a vernacular he did not understand. This changed in 1984, when he won the award for best singer for “Manou Tchirey,” a song of his own, written in the Songhaï language. After winning the same award an unprecedented second time in 1986, he took the band to the northern regions of Mali and to Niger, where Songhaï was spoken regularly, and toured much of the western Sahel region. Sidi does not, however, only focus on the traditions of Songhaï to inform his music. As a young man, he would often be seen sporting a leather jacket and sunglasses and listening to J.J. Cale and Kenny Rogers. Sidi’s sound both captures and challenges his roots. The music moves from the translucent swaying takamba to the trance inducing Holley, while the lyrics often address many non-traditional issues. Sidi has a critical mind and his songs have a purpose. For example, in “Adema,” Sidi and his collaborator sing about how to electrify and modernize their country. “The songs must come from within,” says Touré. “If I sing about things and there is no change, then it will have been a waste.” He strives to be more than a singer, but in fact a creative artist that affects change.